launched Beijing Shahe University Town project in 2000, which echoes Beijing’s commitment to “Revitalizing the Country with Science & Technology”, and “sustainable higher education in the capital city in the 21st century”. The University Town, covering 8 km2 and composed of educational institutions, office buildings, commercial establishments and residential quarters, stands out in Beijing’s new landscape. Its tenants include five top universities of the country in different fields, such as Central University of Finance and Economics(CUFE), Beijing University of Posts and Telecommunications(BUPT), Beijing University of Aeronautics and Astronautics(BUAA), Beijing Normal University(BNU), and China Foreign Affairs University(CFAU), representing 80,000 students and 20,000 faculty members in total. 2010 marks a milestone for the University Town, with basic facilities up and running and around 10,000 occupants from CUFE and BUAA moved in. The Changping Line of metro service was officially open on Dec. 30th, followed by the commencement of construction for BUPT and CFAU in the new year. Located in Jiaxing City Science and Technology Incubator Center, Jiaxing International Bio-tech Park is a high-tech industrial park jointly developed by Shanghai Pharm Valley Corp. and BDF Bio-tech (Shanghai) Inc. As an important leading role of Jiaxing bio-tech and pharmaceutical industry, Jiaxing International Bio-tech Park dedicated to outsourcing in clinical medicine, researching on new medicine, manufacturing bio health products as well as introducing, incubating and serving related supporting industries. The park established partnership with Uppsala Bio, Sweden, University College Dublin, Ireland, Kuopio Hi-Tech Park, Finland and other Education and scientific research institutions. There are a number of foreign-funded enterprises, such as Study Manager form U.S., and domestic enterprises like Shanghai Fuhua, settled in Jiaxing Bio-tech Park. Eli Lilly, the Shanghai Pharmaceutical Group, Charls River and some other well-known enterprises came to visit the park, and intends to further cooperation. With the continuous advancement of attracting outside investments for Jiaxing International Bio-Science Park, industrial clustering effect will be more obvious within the next five years. 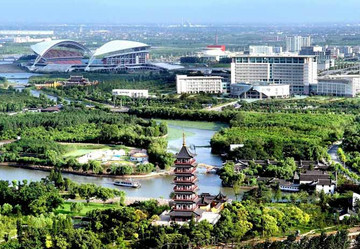 Jiaxing International Bio-Science Park will become the most influential of the bio-industry R & D and service outsourcing bases in Zhejiang Province.